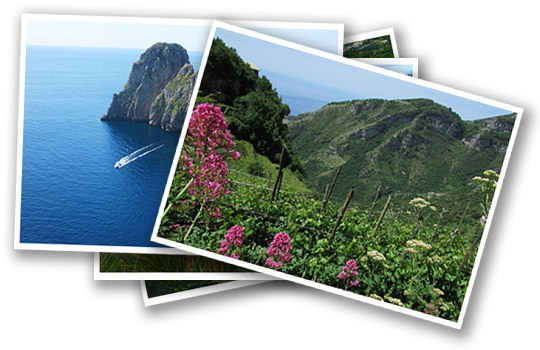 The Amalfi Coast is world famous for its spectacular coastline and the picturesque towns clinging to the hills. 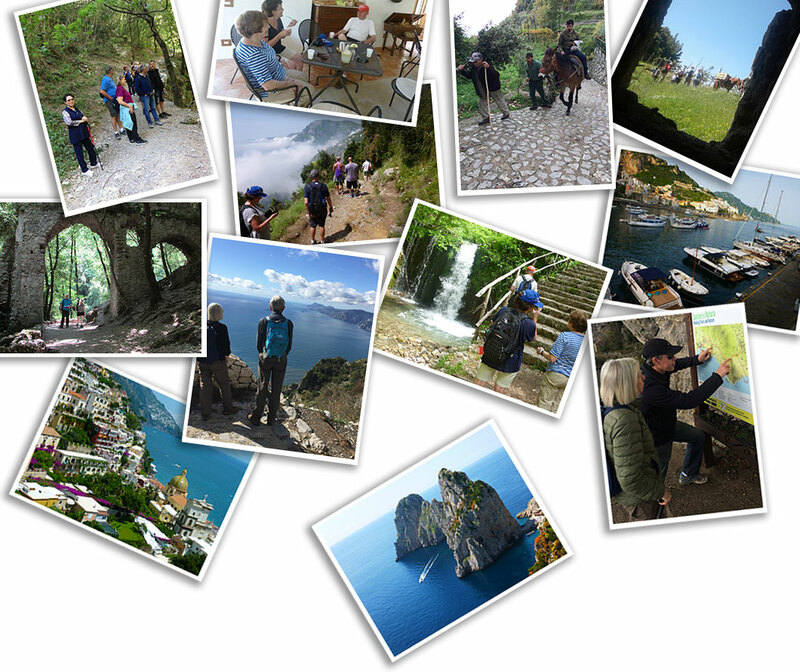 What is less well known are the fascinating ancient walking trails along the Amalfi Peninsula. 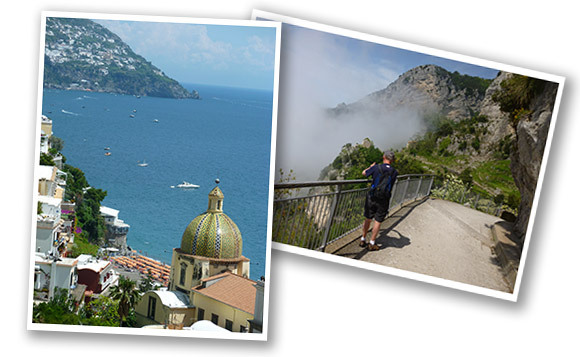 The six day Amalfi Coast Walking Tour allows you to experience the best of the Amalfi Coast, featuring towns such as Positano, Amalfi, Ravello and nearby Capri. As well as this the walks give you an in-depth insight into the lifestyle of the people who cultivate this land, the natural beauty (stunning sea views), and the layers of history that make up this fascinating region. Each day is a combination of walking (generally the morning) followed by time to relax and unwind in the charming villages along the coast. Charming coastal villages, we visit on a private tour. 'Italy With Pleasure' provides a Tour Manager for the duration of the trip, who will coordinate all activities and accommodation. We provide guiding for all of the four walks. All breakfasts are included with the accommodation, plus main meals included as listed in the itinerary. All transport during the tour is included. Pick up and drop off in Rome. 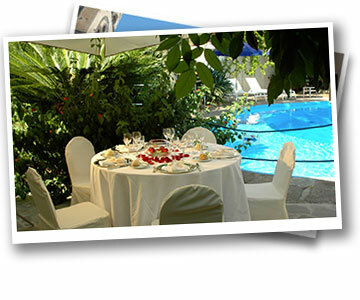 The hotel we use for this tour, the Reginna Palace Hotel, is a 4 star hotel right in the heart of the town of Maiori. By staying centrally you get to really experience the vibrancy of this town. The hotel is wonderfully situated on the waterfront. One side you have uninterrupted sea views, and a few steps the other way you have ‘la dolce vita’ of Italian piazza life. You can stroll into town whenever you like to have a gelato or browse the shops (with no shuttle bus needed like you would from hotels further from town). Outside the hotel is a swimming beach, perfect for relaxing after a day out walking and sightseeing. Additionally the hotel has its own excellent pool and jacuzzi, as well as a full range of features is included, such as wifi, air conditioning, and a cocktail bar. We meet in Rome and from here we start our journey south toward the Amalfi Coast with a few interesting stops along the way. Our first stop is at Montecassino, site of the major WWII battle, where we visit the Allies' cemetery. 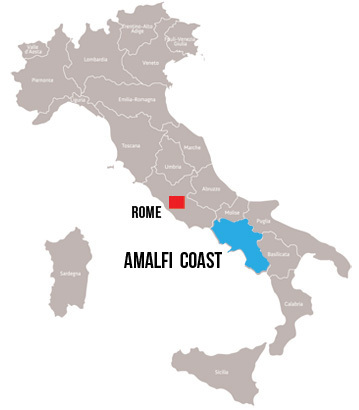 A short drive after lunch takes us to the start of the Amalfi Peninsula and the town of Vietri Sul Mare. This is where the famous coloured ceramics are produced, using the maiolica method. We visit a manufacturer where we can see the ceramics being produced and painted, continuing a tradition that started in the 1500s. We see the incredible array of colours and designs of their finished product. Following a drive along the stunning Amalfi Coast road, with hairpin bends and amazing views in equal measure, we reach the town of Maiori, where we stay for the duration of the tour. Our hotel is wonderfully situated in the centre of town, making it easy to come and go as you please. A few steps away you have ‘la dolce vita’ of Italian piazza life. In the evening we have a Welcome Dinner and our first taste of the superb cuisine of this region. This is our first walking day, and the trails that we follow are based around the town of Scala. In the morning we are driven to a high point (so we avoid walking uphill), from where we follow paths winding through well-tended vineyards and orchards, passing through several small villages where life still revolves around working the land through the seasons. As we are quite high up we have frequent photo stops so you can capture the rugged beauty of the coastline below us. We then enter the Valley of the Mills, a narrow valley that was historically a hive of industry, with paper mills and iron works. Today it is largely back to its natural state, but it is fascinating to see the remains of these historic buildings. Our trail takes us along one side of the valley heading inland, which gives us a quite different landscape and flora from the previous day’s walk. The head of this valley is a nature reserve, with a series of waterfalls and lush forest wedged between dramatic limestone cliffs. This nature reserve protects rare ferns, which can be seen growing in this shaded and fertile part of the valley. 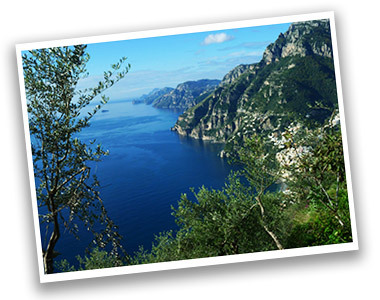 We reach the town of Amalfi by early afternoon, so there is plenty of time to explore here independently. Or just find your nearest café, put your feet up and sample the local specialty – limoncello! Before returning to Maiori we visit the cathedral, Sant’ Andrea. This is more than just a church. 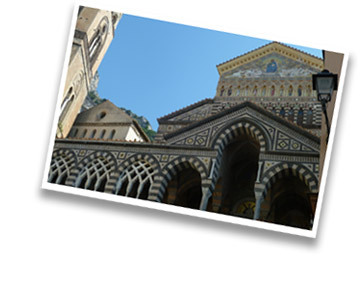 Rather it is a complex of different buildings from different era, and is the heart of Amalfi. From the evocatively named ‘Cloister of Paradise’, with elegant marble colonnades, frescoed private chapels and ancient Roman sarcophagus. The Romanesque style Church of the Crucifix. The 13th century Crypt of St Andrew, down below the church, where the remains of Saint Andrew are held. And finally into the main cathedral, with its elaborate baroque decorations. 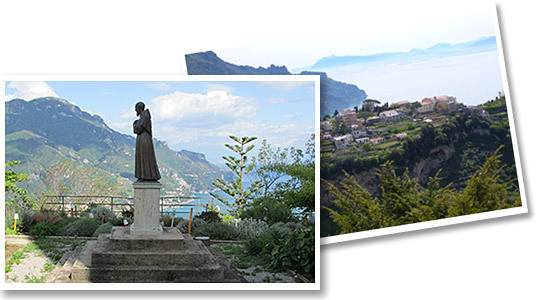 Departing from our base in Maiori, we walk on of the prime walks of the Amalfi Coast, the ‘Sentiero dei Limoni! 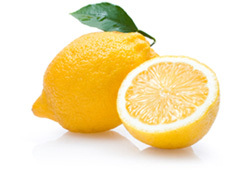 (the ‘Walk of the Lemons’). 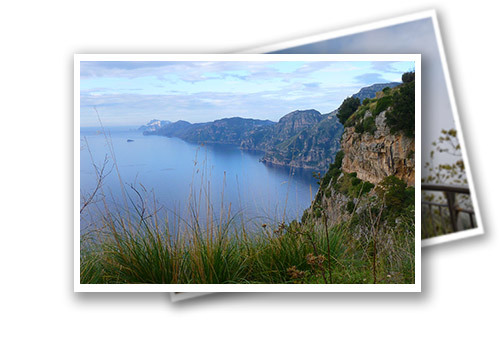 This walk leads you through terraced lemon groves around a headland, with fantastic views over the coast. The walk today is not too long or demanding – think of it as a morning stroll. 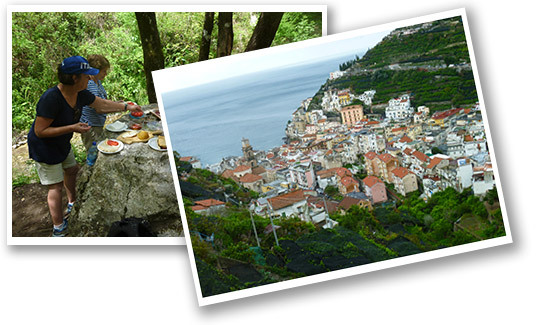 We reach the town of Minori where we have a coffee stop, then continue on to the charming town of Ravello. 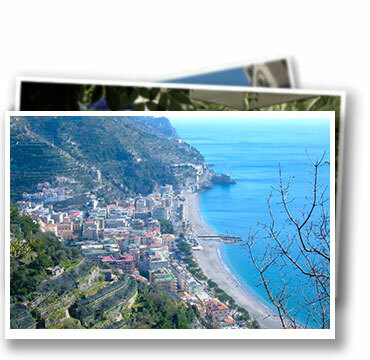 Here you are free to explore Ravello independently during the afternoon. 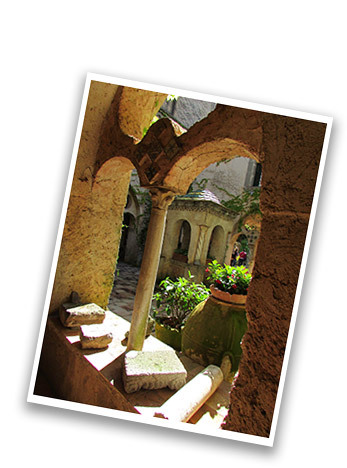 Ravello is a fascinating town, with layers of history to be seen. We visit together the Villa Cimbrone, an elegant historic residence with formal gardens. From the terrace of Villa Cimbrone you have amazing views down to Amalfi. 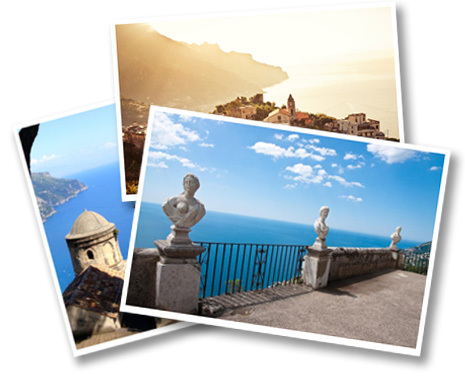 Later you have some free time to explore Ravello independently. 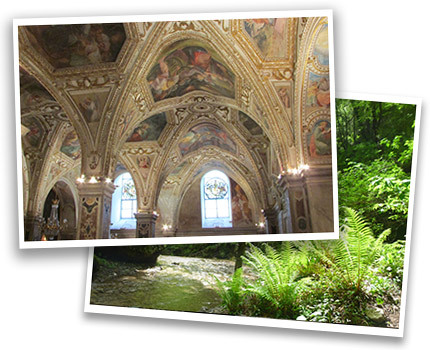 Of particular note are the buildings and gardens of Villa Ruffolo, and the cathedral. Or simply wander through some of the lanes, and relax around the piazza area where there are numerous shops and cafes. Ravello is famous for vibrant hand-painted ceramics and for the excellent local wine, both of which can be found in the specialty shops here. We drive up to a high point on the Amalfi Peninsula, and from here we start today’s walk which has the grand title 'The Path of the Gods' (Sentiero degli Dei’). This is one of the more popular trails on the Amalfi Coast, and walking along this path high above the sea you’ll see why it has gained such renown. It commands fantastic views right out to the island of Capri. The trail takes you through a mixture of wooded areas as well as typical Mediterranean countryside, rocky with wild herbs, flowers and scattered olive trees. Goat herders are often seen on the grassy terraces tending their flocks and peregrine falcons soar high above. The walk is 2 ½ hours duration and finishes in the town of Praiano. Following the walk we go to Positano. Famous for elegant fashion boutiques and seaside charm, this has been a holiday destination since Roman times. The afternoon is clear for some free time in Positano, which has an enviable combination of a good beach with a broad seaside promenade, with cafes and chic boutiques jostling for position in the pastel coloured buildings. This is a good time for a swim. You can spend some of the afternoon exploring the narrow back streets lined with bougainvillea, or just find your nearest café, put your feet up and sample the local specialty – limoncello! To return to Maiori we go by boat, and cruising along the coast reveals a new perspective on the area with some incredible houses tucked away, and tiny hidden beaches. 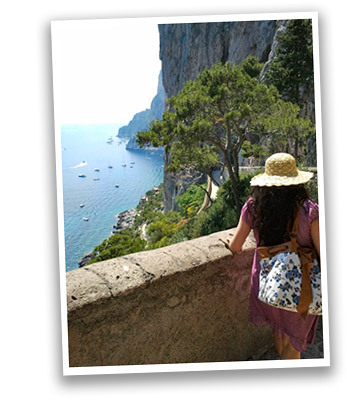 Today we travel to Capri, a favoured destination for the rich and famous in recent times, but also with an interesting history stretching back beyond ancient Roman times. On Capri we take the funicular railway up to the town centre, where top fashion boutiques jostle for space alongside locals selling fruit and vegetables. 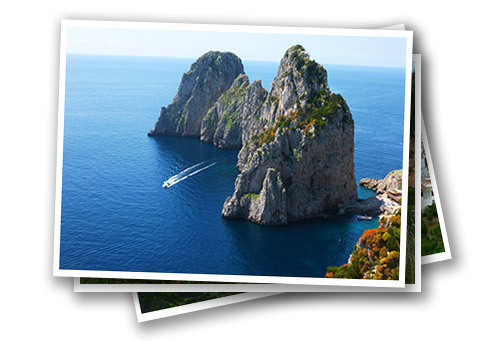 Starting from the centre of town we walk out to a monastery that has a view point looking out to the Faraglioni, the towering rocks emerging from the sea which are such a distinctive feature of Capri. We then have a lunch break before heading out to the Villa Jovis. Passing a series of luxury villas and gardens, you head through the outskirts of town and reach the ancient Roman site. The Villa Jovis was the largest and most sumptuous of the island's 12 Roman villas and Tiberius's main Capri residence. A vast pleasure complex, now reduced to ruins, it famously pandered to the emperor's debauched tastes, and included imperial quarters and extensive bathing areas set in dense gardens and woodland. The stairway behind the villa leads to the 330m-high Salto di Tiberio (Tiberius's Leap), a sheer cliff from where, as the story goes, Tiberius had out-of-favour subjects hurled into the sea. Today Tiberius's Leap is worth a look for the view. Later in the afternoon you’ll find Capri has plenty of scope for simply browsing the shops and enjoying the ambience. Stroll down to the Gardens of Augustus for some more great views. We return by ferry to Maiori late afternoon. In the evening we have the final dinner, enjoying the best of Amalfi Coast cuisine and celebrating the week we've had in this special part of Italy. By now you know the local barista by name - and he knows which coffee you order - but we must say 'arrivederci' to the Amalfi Coast and return to Rome. En route we visit the ancient ruins of Pompeii. Here we have a guided visit, where we see evidence of the lifestyle of the inhabitants of this Roman city, as well as the destruction caused by the eruption of Mt Vesuvius in 79AD. Even for those who have visited Pompeii before, having a specialist guide provides an in depth experience and is very revealing. We enjoy a final lunch together in Pompeii, having our last chance to enjoy regional cuisine, before heading north to Rome. We reach Rome early evening. * Price is denominated in Euros. Prices listed are based on twin share.